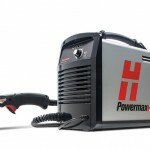 The Powermax30 XP is a highly portable, 30 A, handheld plasma cutting system appropriate for a wide range of applications. It uses air or nitrogen to cut electrically conductive metals, such as mild steel, stainless steel, or aluminum. For the full data sheet, please click here. © 2014 Mersey Equipment. All rights reserved.